A wild upbringing has always led Michelle towards a creative path. After traveling to New York from Anchorage Alaska and graduating from Parsons school of Design in Women's Ready to Wear, she worked for several design companies including Ralph Lauren and Lane Bryant prior to launching her accessories line. As children, she and her siblings spent their time away from Alaska living on the Two Gray Hills Navajo reservation in New Mexico learning to live off the land. With no running water, and no electricity, this environment was ideal for forming a solid foundation of her interactions and responsibility to the land. Always relying on her Native American heritage to inspire and influence her design process, Michelle's designs reflect a rich narrative of reaching from the past, and pulling into the present or what she calls, "Living In-Between". Living in-between these two worlds, that of her ancestors, and of one that ventures into the metropolitan savvy dweller, has been an obsession that manifests in her accessories. The beauty of craft and handwork can be seen in each unique piece. 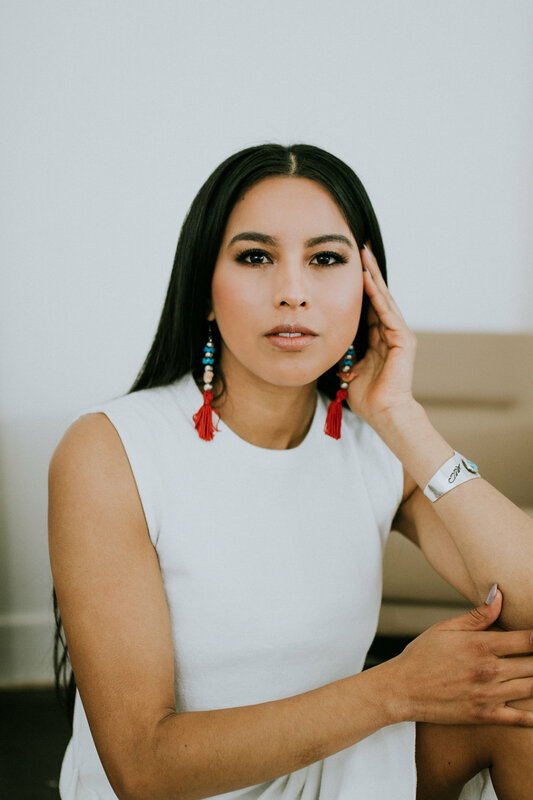 As a Navajo woman in design, it is her passion to support and represent indigenous artists and champion the future of Native peoples and their rich cultural heritage. Michelle is currently based in Salt Lake City Utah.